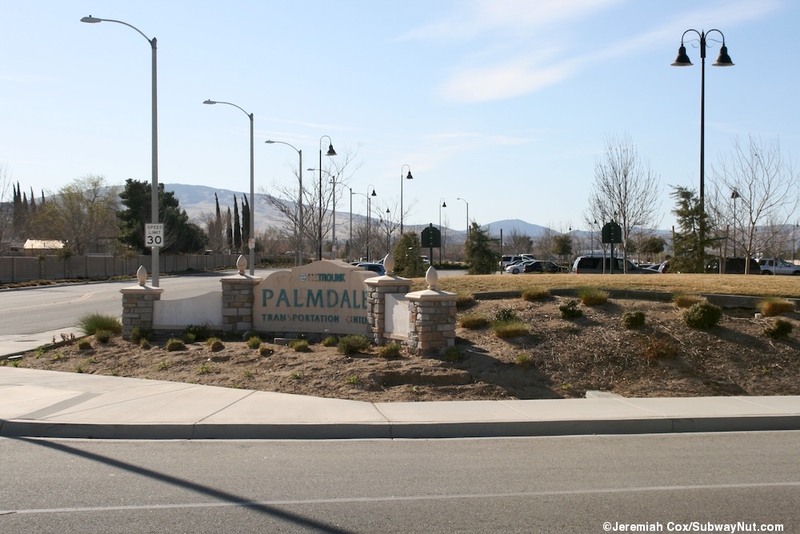 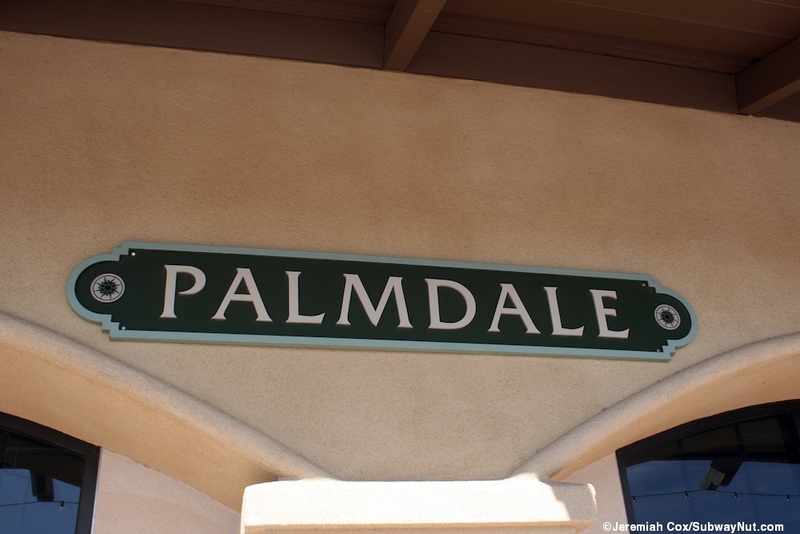 The Palmdale Station has had two lives. 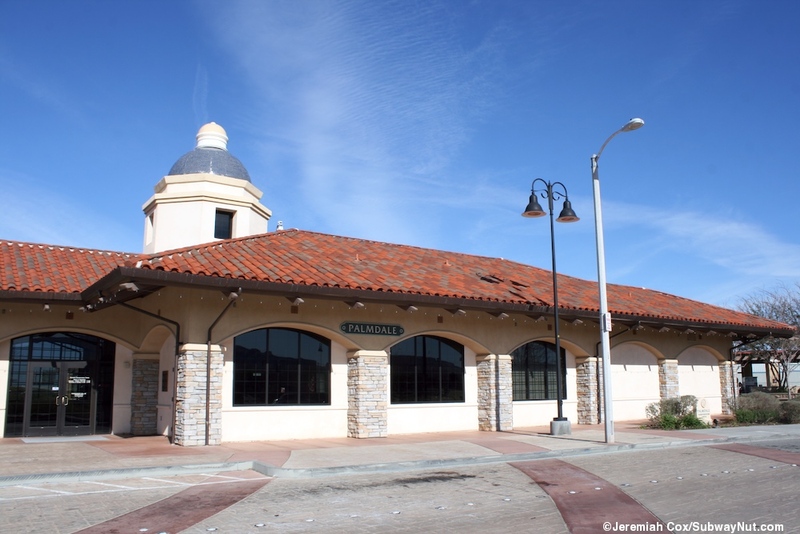 The first incarnation of the station was one of the "3-day miracles" opened on January 24, 1994 after the Northridge Earthquake. 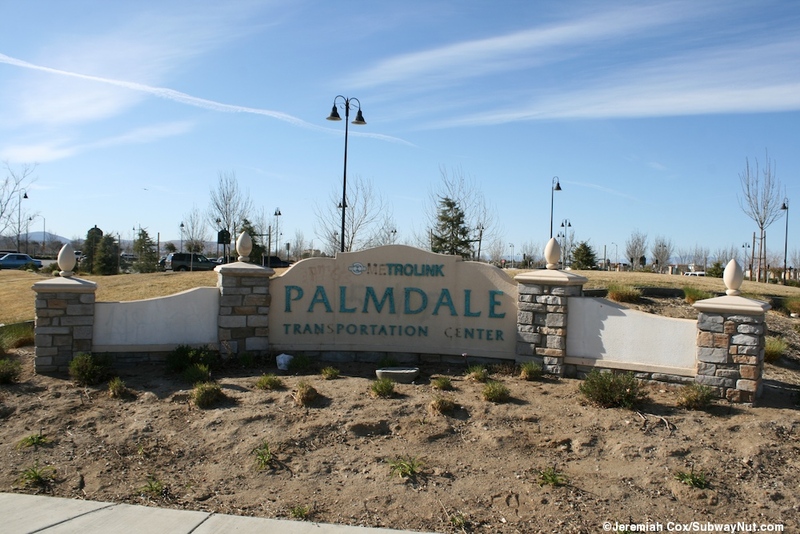 This station was on the edge of the Palmdale Airport about 3 miles north of the current station but had to close on June 20, 1994 after the city did not spend $300,000 on a pedestrian underpass to keep the station open after trains relocated on different tracks along the 3 track line ('Palmdale Station Set to Close June 20,' Daily News of Los Angeles, June 10, 1994, Link). 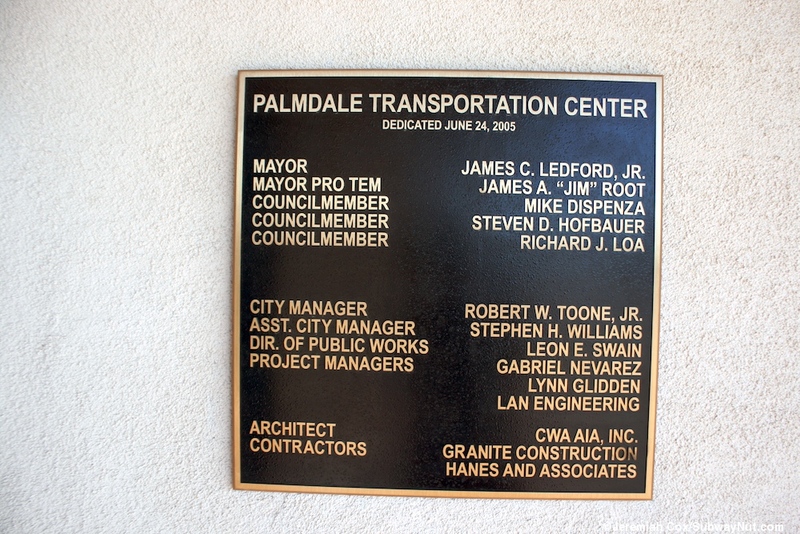 Metrolink service for passengers in Palmdale was restored on April 25, 2005 ('Making Tracks,' Daily News of Los Angeles, April 26, 2005) and the $14.8 million Palmdale Transportation Center was fully dedicated on June 24, 2005 (a dedication plaque informs passengers). 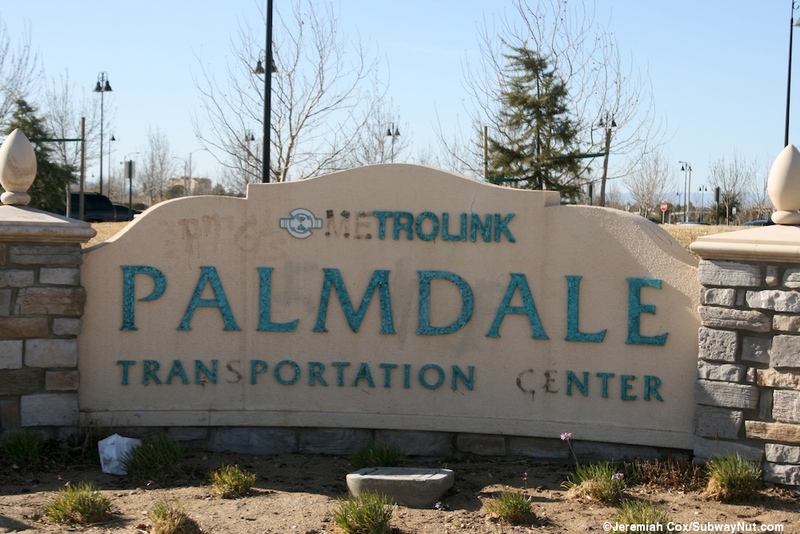 Today it also serves Greyhound passengers, Amtrak California thruway buses (Amtrak code is PMD) twice a day up to meet San Joaquin trains in Bakersfield and many local Antelope Valley Transit Authority (AVTA) bus lines, all stopping at the station's bus loop. 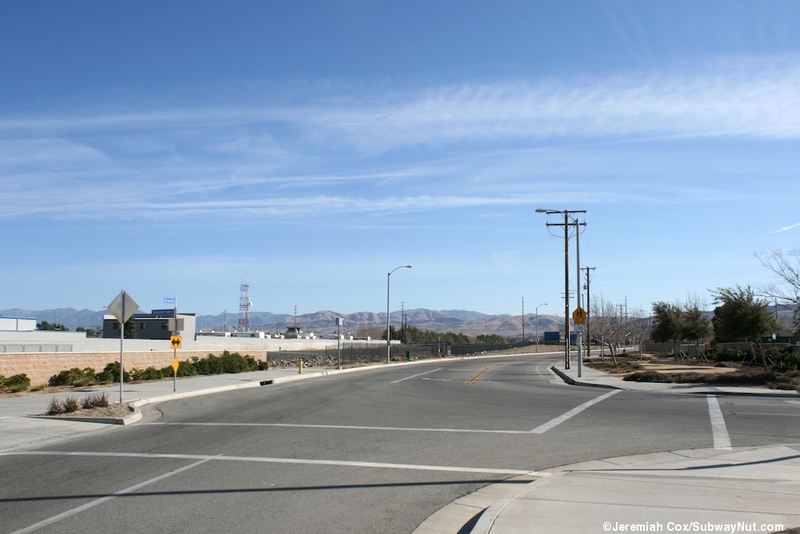 The station is located outside of downtown on the edge of industry and subdivisions. 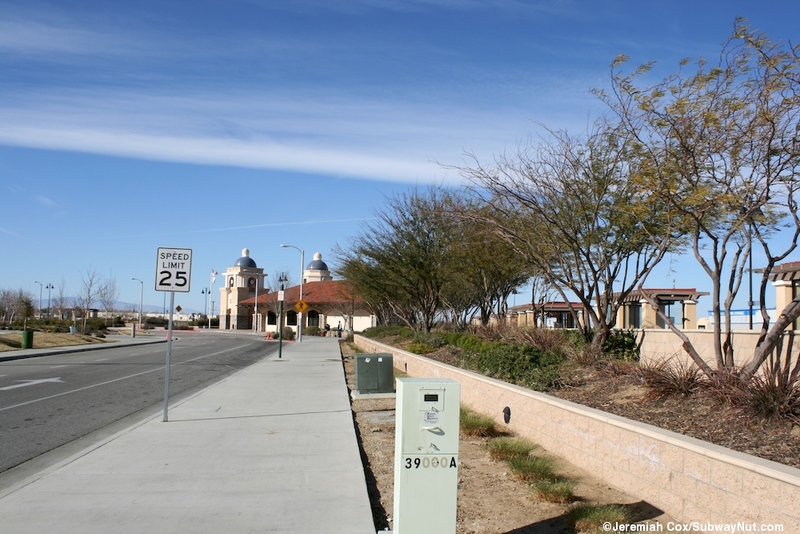 There is a single platform to the west of the two tracks that pass through the station, with a fence between them to prevent trespassing. 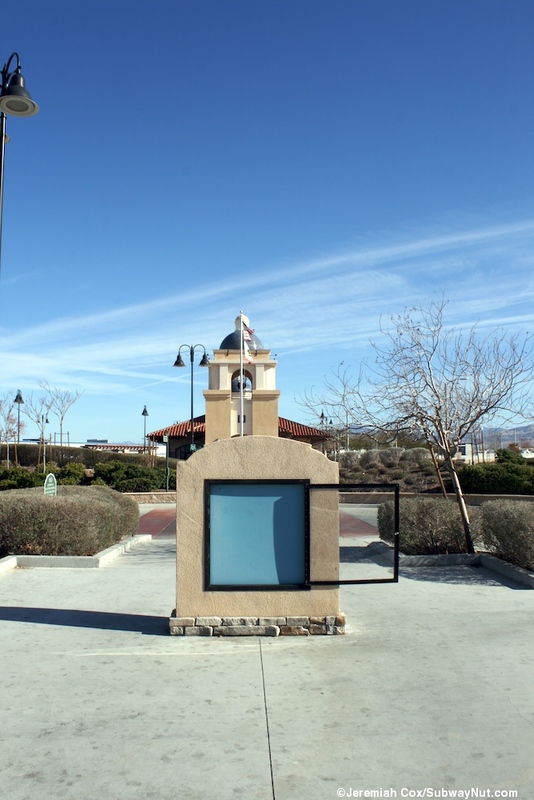 This platform has a tactile warning strip and the required mini-high platform with its ramp for wheelchair boarding. 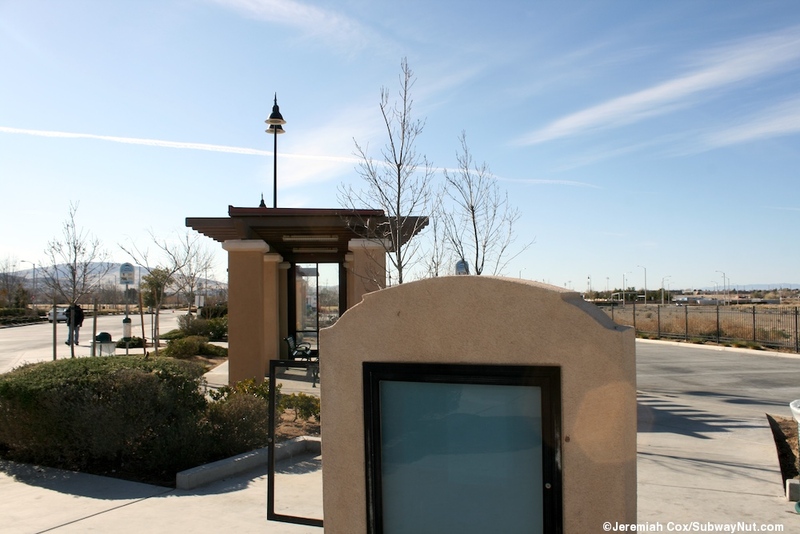 There are six small waiting canopies each with large square columns and a wooden roof. 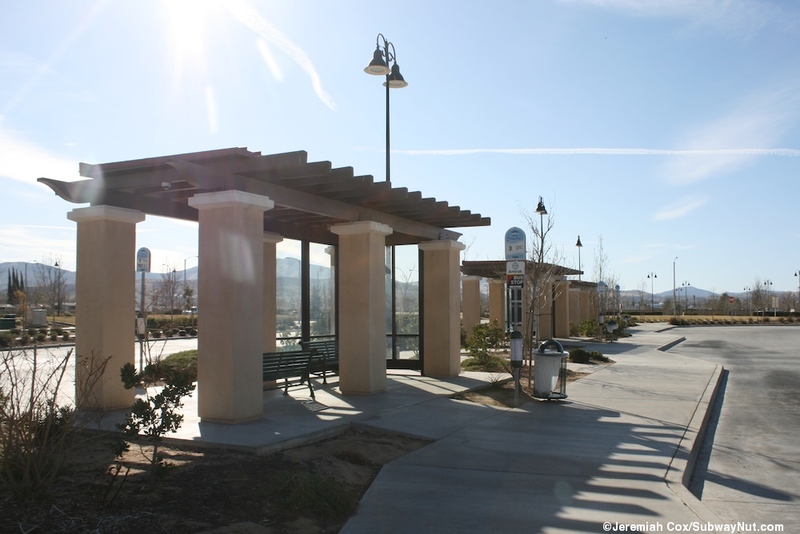 Glass is on three sides except towards the track and there are benches inside for waiting passengers. 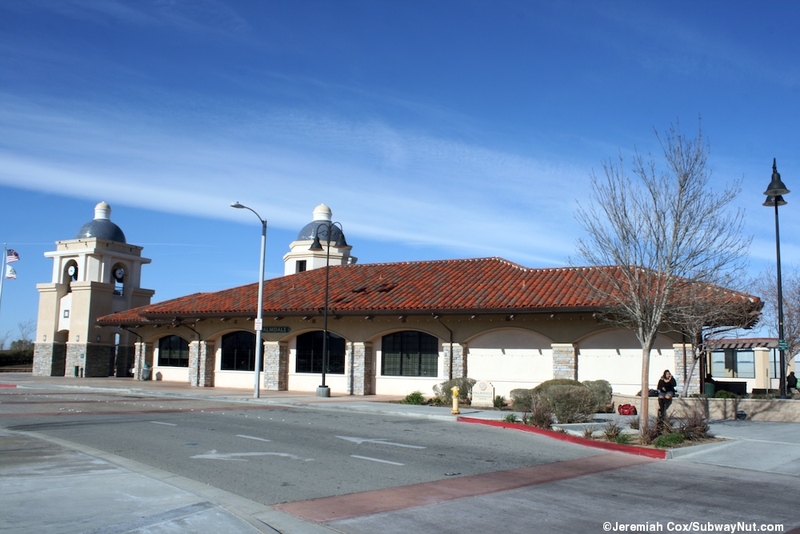 The only entrance to the platform (the southern end is along the access road near one of its entrances at the corner of 6 St E and Transportation Drive) is along eachside of the modern depot building of the transit center in the middle of the platform. 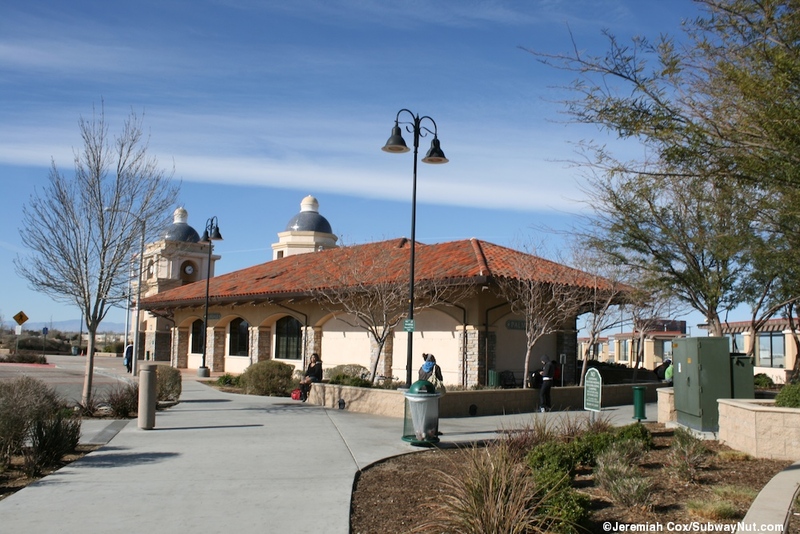 This is designed to replicated historic train stations, it is a single story with a gabled red tile roof and central tower in the middle with a small blue dome. 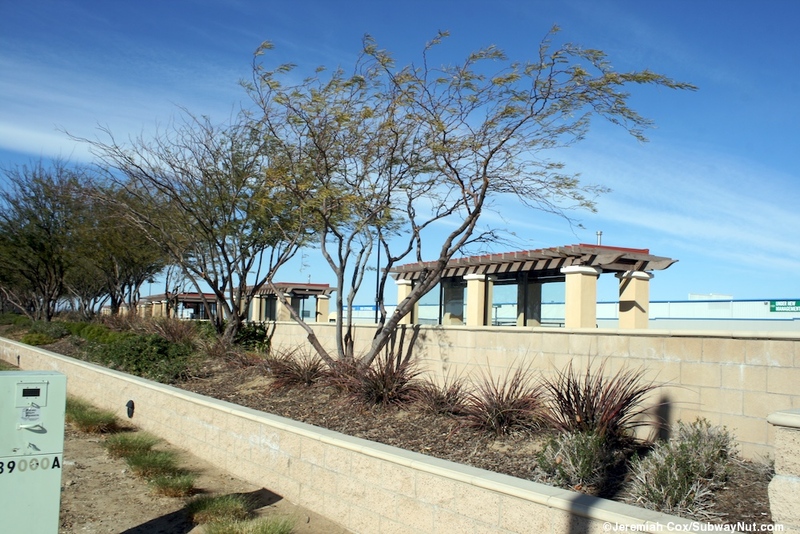 It has arched walls held up by stone pilings. 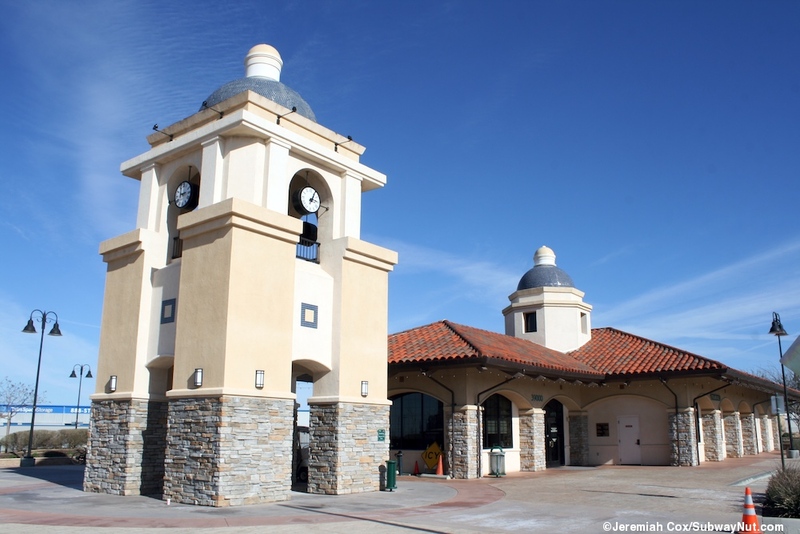 Inside is a waiting area, the clocktower cafe (a concession closed on Sunday when I was there), three vending machines, and a Greyhound ticket office. 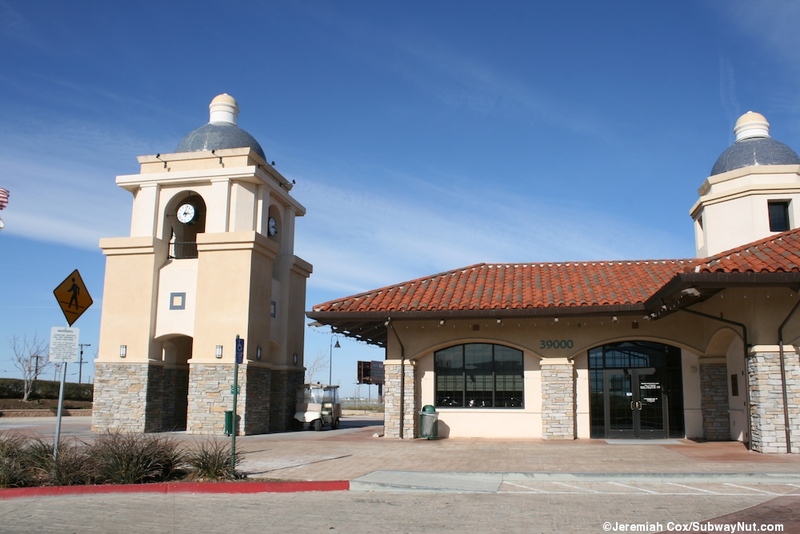 Surprisingly there is no more AVTA pass sales at the transit center. 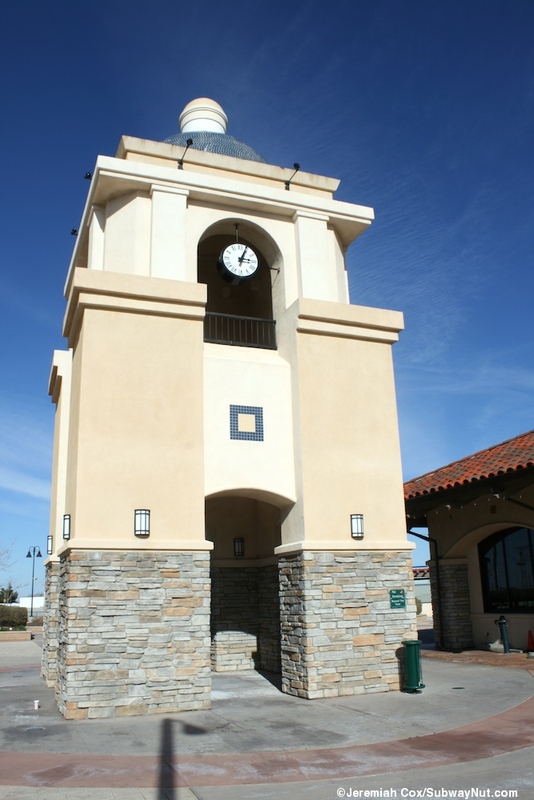 Just north of the building is the clock tower located in its own plaza. 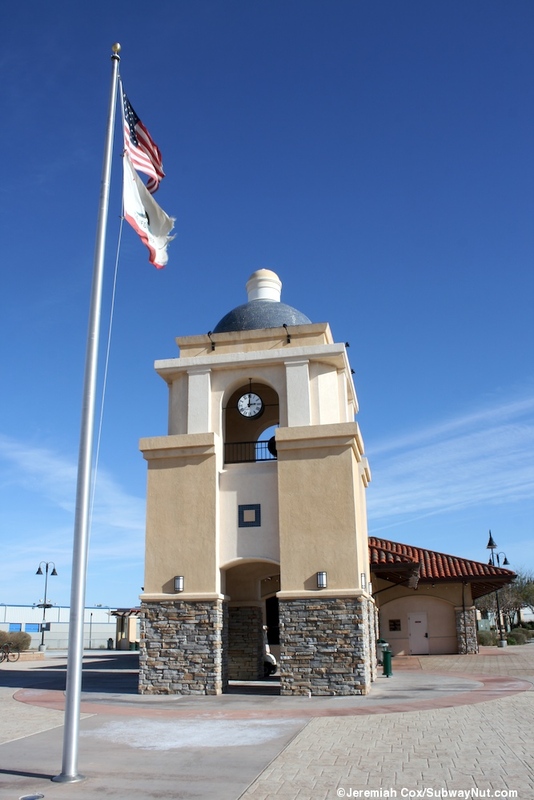 This relatively short tower has a similar blue dome as the depot, with stone pillars leading up to more conventional ones and small clock faces on all four sides. 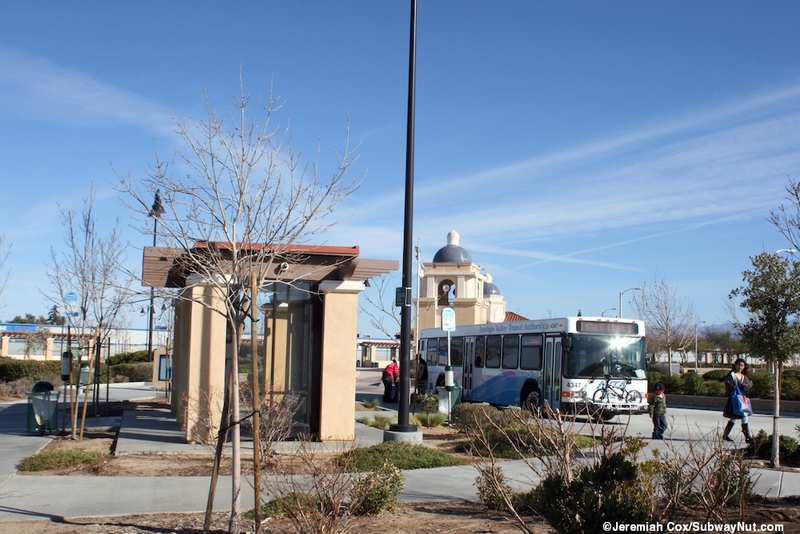 This all leads out to the access road and across from here is the bus loop perpendicular to the rail platform with eight different stops and 4 shelters designed like those on the rail platform. 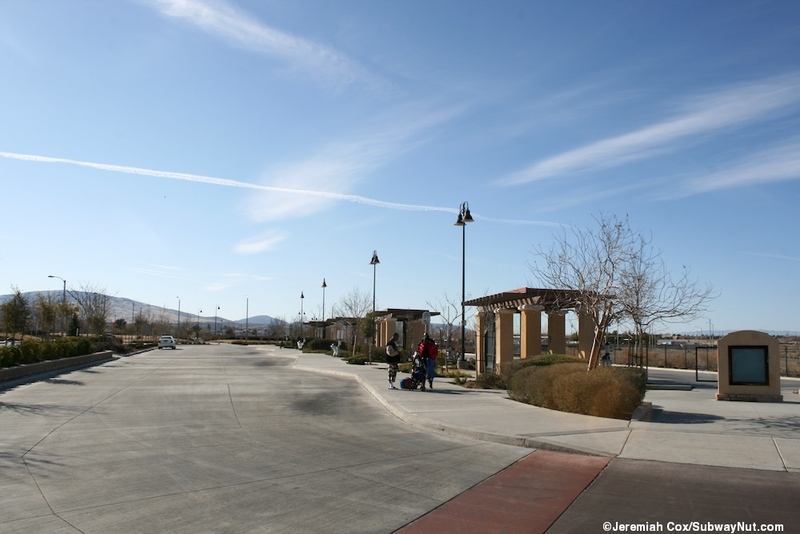 The stop is surrounded by about 750 parking spaces in three different lots.